Renault is teaming up with "Solo: A Star Wars Story" to provide a thrilling experience for its customers ahead of the launch of the film, released in UK cinemas on 24 May 2018. From April to July 2018, Renault is inviting everyone to 'take the alternative road' through a pan-European campaign - designed and produced in collaboration with Lucasfilm, Disney and Publicis Conseil. For the French car manufacturer, this is an unprecedented collaboration which will be live in 25 countries throughout Europe. When Renault joins forces with "Solo: A Star Wars Story", it's natural to expect adventure. In the all-new movie featuring the most beloved scoundrel in the galaxy, we'll find out how taking the alternative road led Han Solo to meet his mighty future co-pilot, Chewbacca. Now, thanks to the features of Renault KADJAR - 4x4 transmission, emergency breaking system and blind-spot alerts - Renault is offering its customers their chance to 'take an alternative road' too. From 9 April 2018, Renault is giving everyone the opportunity to be a part of Han and Lando's adventure in "Solo: A Star Wars Story" in selected dealerships*: Visitors will be invited to watch an exclusive scene from the upcoming film, seven weeks before its release. To add even more excitement, the preview is brought to life though virtual reality (VR) technology. Are you ready to take the alternative road? Renault has also partnered with Shazam to provide those on their commute a chance to taste the Renault and "Solo: A Star Wars Story" experience - at their bus stop. Taking part is simple: participants just have to use their Shazam app to scan the Renault and "Solo: A Star Wars Story" out of home advertising - then the adventure begins. 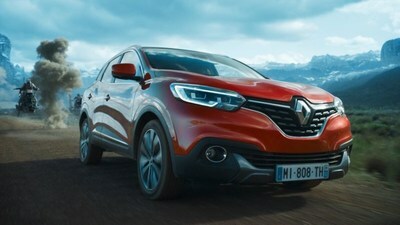 This activation launches a video where the user can explore the Renault KADJAR, observing each aspect of the vehicle as if it was just in front of their eyes via augmented reality. Users then click through to learn more about the features of the vehicle. The augmented reality experience is just one part of the fully integrated campaign, which also includes a TV spot that stars Chewbacca. Renault also worked with leading visual effects company Industrial Light & Magic, known for their work on the Star Wars films, to create the special effects in the TV spot. In addition to the exclusive in-dealership and Shazam experiences, Renault is also running a national competition which will provide those who enter the chance to win a variety of goodies and "money can't buy" experiences. Consumers can enter the competition by visiting their nearest dealership. Alongside the TV spot, press and out of home materials communicating to the general public, the majority of the assets developed will be published on digital platforms. The content has been developed with customer profiles at its heart, providing a tailored experience for each different audience.